What can I say......... You can't go wrong flying the colors. 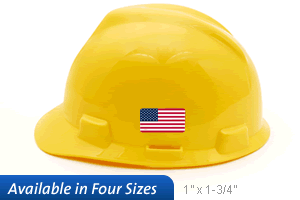 This small sticker was not a mandatory uniform/hard hat specification however, this small sticker creates a large amount of company and country pride among our staff. Our customers also takes notice.....and the pride is shared. Great product. Goes on and stays on wrinkle free. I really like the little flags just would like a size between this one and the next size up. These seems very small but the next sizeis too big.